The global boom in renewable energy is posing new threats to birds say experts. At the UN climate conference in Bonn, researchers said wind turbines and power lines were a particular problem for migratory soaring birds. 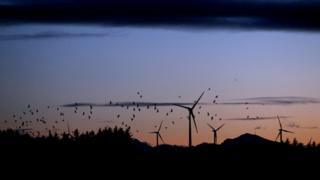 Shutting down wind farms on demand is one of the methods being tested to protect these birds from collisions. Other ideas being tried include placing highly visible deflectors every 20m on power lines. The Rift Valley and Red Sea flyways in Egypt are among the world's busiest corridors with huge numbers of migrating birds travelling between Europe and Africa twice a year. Around 1.2 million birds of prey, 500,000 white storks and 66,000 white pelican migrate each year along this particular flyway. Some will cover 10,000km on their journey. Unfortunately this area is also where Egypt is developing new, large scale wind farms. At one wind park, El Zayt, over 290,000 migratory birds flew through it in 2014. Concerned about the impact the twirling blades may have on the species flying over, the Egyptian Environmental Affairs Agency in collaboration with the wind farm developers and bird experts set out to test a new shut down on demand protection system. In Spring 2016 they set up two radar units, with field ornithologists on site located at vantage points 2.5-5km from the wind farm and less than 5km apart. When birds were detected the turbines could be shut down within four minutes. Details of the trial are still being assessed but according to those who presented details of it at this meeting, it was a success. "We are still awaiting the monitoring information," said Aida Kowalska from Birdlife International. "The project went really well, and it's a great success we've managed to pilot guidelines that actually work on a wind farm site." The researchers say that they are fine tuning the system, increasing the number of birds that trigger the shutdown from 10 to 50. It could be used with other wind farms they say, but it is not a one size fits all solution to the issues of birds and renewable energy. "It's a model that could be applied elsewhere but it is particularly useful in the context of migration," said Edward Perry, also from Birdlife International. "This is one of many measures you can take, but the first step should be identifying the best site to reduce the impact in the first place." The delegates also heard about efforts in Germany to reduce collisions between birds and electricity cables. The country's rapid uptake of renewables particularly wind have seen a speedy growth in the number of pylons and wires being used to carry power from the north where it is generated to the south and west where it is mainly consumed. According to Eric Neuling from conservation campaigners Nabu, more than 1.5 million birds smash into electric wires every year. Grid operators were very initially very sceptical about bird protection but since the 1990s there have been many mutually benefitting projects, according to Eric. "The protectors are put up on the ground wire which is the very thin wire on the top of the power lines themselves," he told BBC News. "The one that works best is a black and white contrasting moving deflector around 50cm high, that gets attached every 25 metres. Because it moves, in most cases the birds see it and fly over and don't collide." Similar systems are being tested in the Netherlands and in Hungary and other locations - but don't expect to see them soon on every power line. "It has to apply to the most effective and most important places."